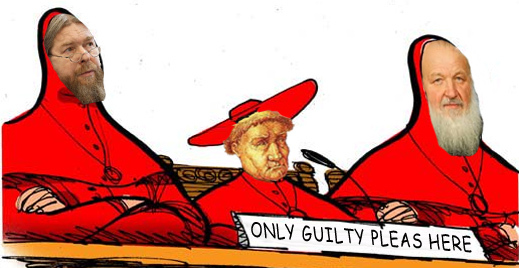 Extracting guilty pleas from the innocent was the specialty of the Spanish Inquisition and its Grand Inquisitor, Tomas de Torquemada (lead image, centre). Extracting guilty pleas from the dead is the specialty of the Russian Orthodox Church, Patriarch Kirill (right), and Bishop Tikhon Shevkunov (left), head of the Church commission investigating the deaths of Tsar Nicholai II and the Romanov family. They were executed on July 17, 1918, by the revolutionary government. Kirill has also declared that his inquisition has the backing of the Russian state, in the person of President Vladimir Putin with whom Kirill claims to have had a private conversation on the matter recently. Molodtsova refused the request this week to confirm whether she is investigating the ritual murder charge. 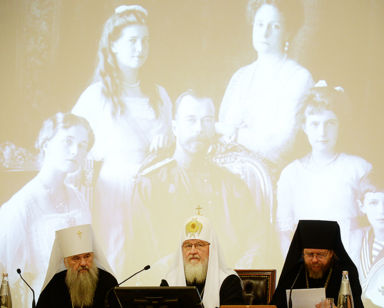 Left: Colonel Molodtsova speaking at the November 27 Church conference; behind her is displayed a slide of the tsar’s skull. Right: Tikhon briefs Putin. Church media publish reports that the 59-year old Tikhon is Putin’s confessor. Other Russian press reports indicate this is Tikhon’s version, and that although baptized and an adherent, Putin has no confessor. Asked on Monday to clarify what exactly Putin has agreed to investigate of the ritual murder allegation, the Kremlin spokesman Dmitry Peskov refused to answer. Asked again on Tuesday, there was no reply. No Russian reporter has asked Putin to clarify his undertakings with the patriarch. For details of other undertakings between Putin and Kirill on the transfer of state property to the Church, read this. Nicholas Romanov was canonized in the year 2000, four years after a Church commission headed by Metropolitan Yuvenaly (Vladimir Polyakov) reported that the tsar’s failures as a ruler, and the evidence of his death were too categorical to justify the conclusion that his life qualified as sainthood or his death as martyrdom. Since the former had been morally culpable, and the latter political-military, Yuvenaly recommended canonization for Nicholas as “passion bearer”, the Church’s lowest grade of saints. That ruled out any religious motive in his execution. Nicholas’s death was an “heroic deed of non-resistance to violence”, Yuvenaly reported. For more details of Yuvenaly’s report and its consequences, read this. Yuvenaly had the backing of the patriarch at the time, Alexei II. Alexei died in December 2008, and in the succession contest, Kirill, then 62, bested Yuvenaly, 73. Their rivalry inside the Church can be followed here. Since he took power, Kirill has eliminated Yuvenaly’s influence, as well as his faction of bishops in the Synod. A year ago, Putin presented Yuvenaly with a retirement gift — the Order of Merit to the Fatherland, Second Class. Left: Putin flanked on his right by Yuvenaly and left by Kirill in a ceremony of May 6, 2012; right, Putin and Yuvenaly at the Kremlin award presentation, September 22, 2016. Most of the evidence documenting the tsar’s death, including records of interrogations of the execution squad, witness testimony, and physical forensics have long been accessible in France and the US, where they were taken by the tsar’s supporters and White Army officers after the civil war. Matching records of military and party communications between Moscow and Yekaterinburg are in state archives in Moscow. Forensic evidence for the identification of the remains, such as the menus of Nicholas’s last meals are in the US; in Russia there are recent dental examination records, indicating Nicholas’s mortal fear of dentists. The genetic testing data are accessible in Russia, as well as abroad. For the newest details, and the most recent assessment of what the accumulated evidence shows, read this. As patriarch until his death, Alexei II was reluctant to endorse fresh Church or state research. 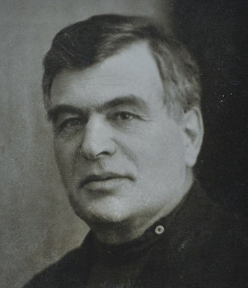 He publicly accepted that the remains of Nicholas and his family, which had been recovered, canonized and reburied in St. Petersburg, were authentic, and that none of the family survived or escaped the execution. Alexei II also put in the record of the Church commissions of his time that there had been no ritual associated with the executions, no ritual murder of the tsar. Krill has publicly claimed that in his conversation with Putin to restart the investigation he told the president “the only thing that stopped us from being able to recognize the results of examinations is the opacity of the research process and a complete unwillingness to engage the Church in this process.” State prosecutors who participated in the investigations of the 1990s, including those for the Yuvenaly report, categorically deny this. They accuse Kirill of lying. According to recent testimony by Vladimir Soloviev, an investigator from the General Prosecutor who worked on the case at the Investigative Committee for more than a decade, Yuvenaly’s commission received all the investigative files and evidence. According to Soloviev, in 1995 Alexei explicitly put to Yuvenaly’s commission the question of whether the execution had been ritual murder. Yuvenaly said no; Alexei drew the same conclusion. In 2015 Kirill, and his two closest allies Varsonofy and Shevkunov, launched a fresh investigation. The new Church commission was chaired by Varsonofy, while Shevkunov ran the operation. At the time it started, Church media reported the commission was focused on authenticating the remains. The rationale at the time, also reported in Church media, was that insufficient interest, let alone veneration was being shown by Russians at the Romanov tomb. The churchmen claimed that if they were able to authenticate with greater accuracy, the genuineness of the bones would attract more devotees. By last week, Kirill, Varsonofy and Shevkunov changed the focus of investigation from the tsar to his executioners, reviving the ritual murder charge. Days later, on the Vesti Saturday television show, Shevkunov repeated his ritual murder allegation, and attacked those who had criticized him for reviving it. To clarify what the secular Russian authorities understand from Shevkunov’s statements and from the proceedings of Shevkunov’s commission, two questions were asked: Do you favour a new investigation by the Investigation Committee of the charge of ritual killing? 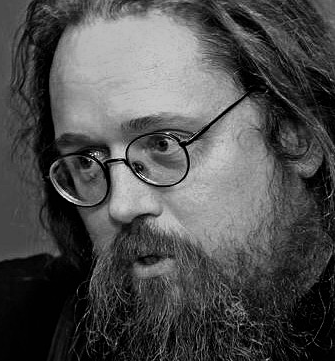 Do you agree with Bishop Shevkunov? The questions were telephoned to the Kremlin for Putin; to the White House for Prime Minister Dmitry Medvedev; to the Speaker of the State Duma, Vyacheslav Voloshin; the Speaker of the Federation Council, Valentina Matvienko; as well as the executives in charge of the two state media, Margarita Simonyan of RT, and Dmitry Kiselev of Sputnik News. Left: Kirill with Valentina Matvienko and Vyacheslav Voloshin. Right: Dmitry Kiselev with Kirill. The questions were requested by email, and were resubmitted. Follow-up by telephone was carried out confirming the questions had been received. All refuse to answer. The Russian media have also failed to get a state official to speak on the record in response to the Church’s pursuit of the ritual murder charge. Reporting by Meduza and by MK speculates that Kirill, Varsonofy and Shevkunov are trying to divert attention away from criticism of the financial mismanagement that has led to the bankruptcy of the Church’s principal banks. For that story, read this.